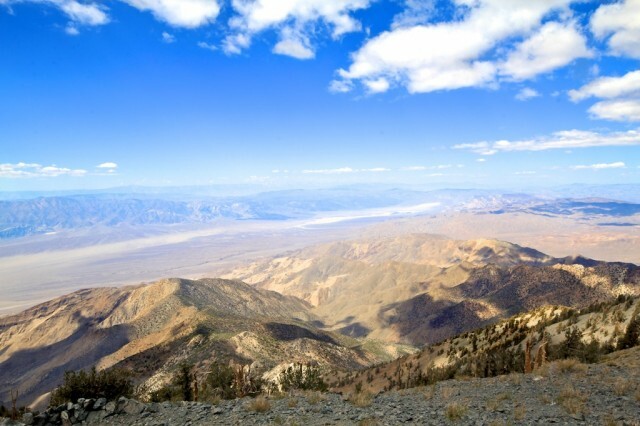 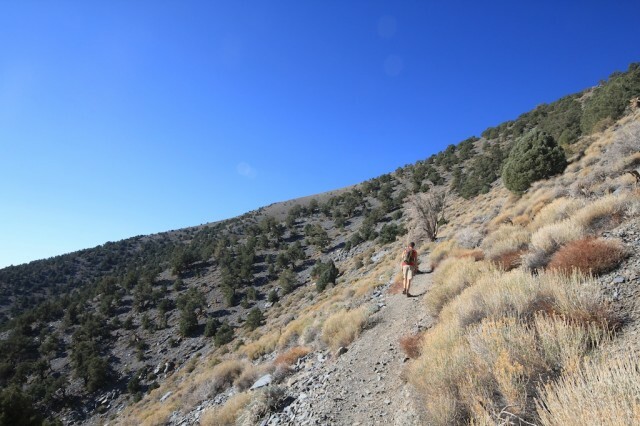 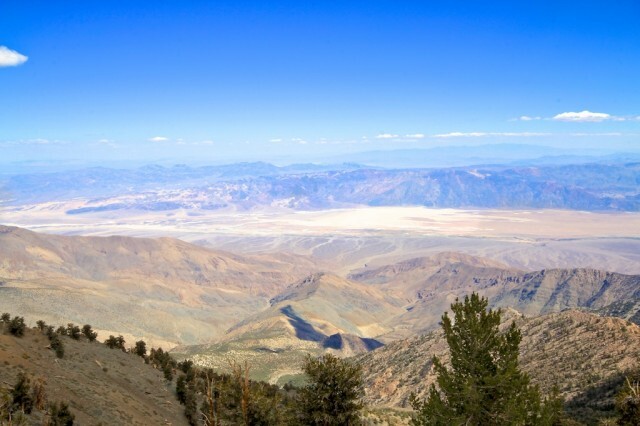 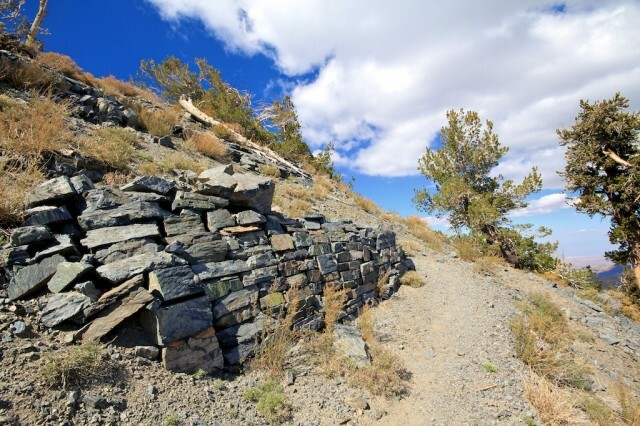 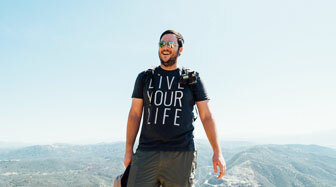 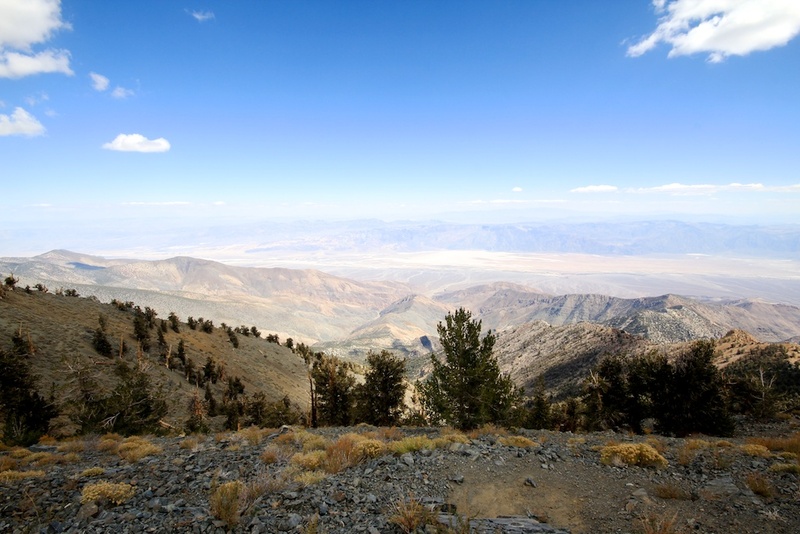 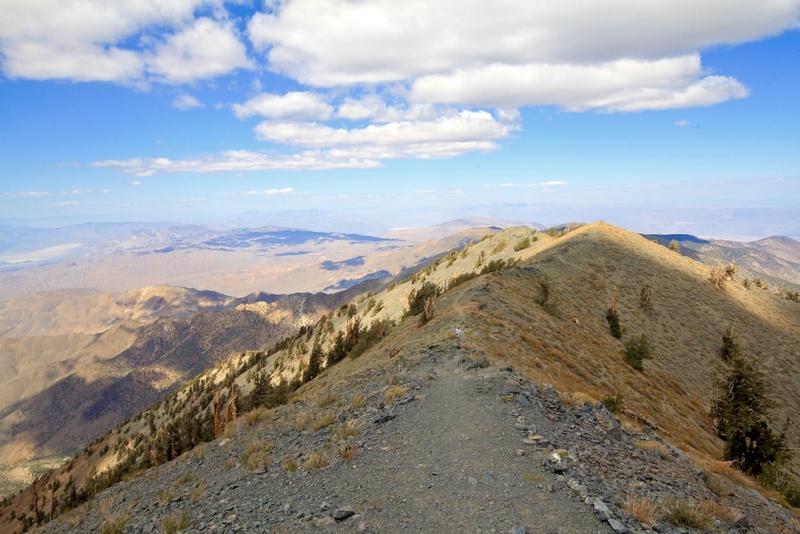 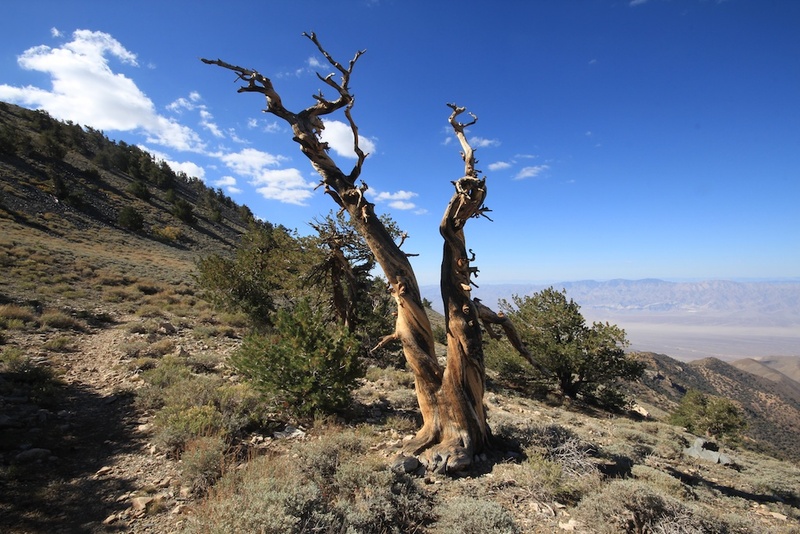 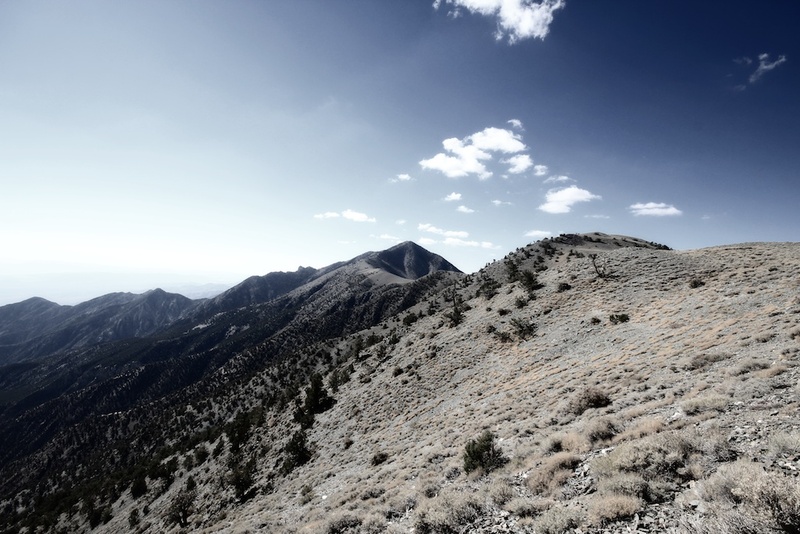 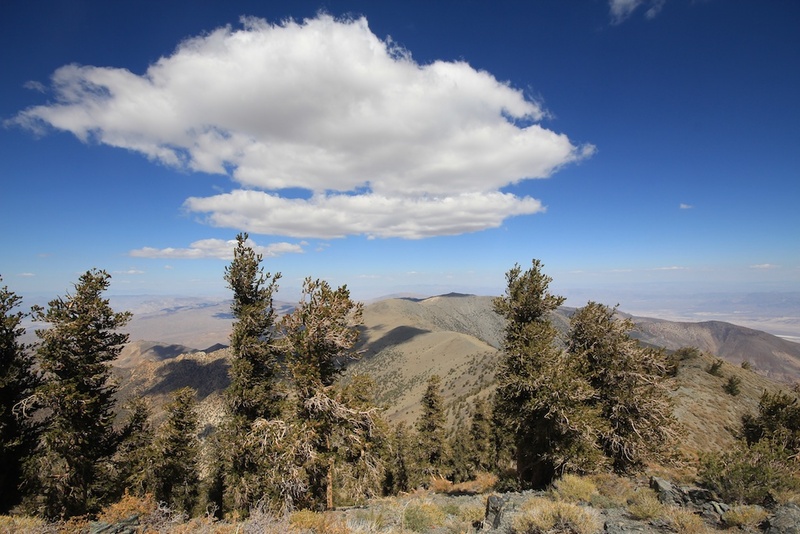 Telescope Peak, the tallest mountain in the Panamint Range, is a hard but doable hike. Coming in at around 14 miles round trip is gains about 3,000 feet of elevation before topping out at over 11,000 feet at the summit. Starting from a road that is inaccessible without 4 wheel drive this peak is a great preparation for other high altitude Sierra peaks or just to be able to stand at a summit that has a drop of over 11,000 feet to the lowest point in North America, Badwater, below. This post is simply to spotlight the standout points of the hike to the top of one of Southern California’s most prominent peaks. The trailhead starts right at the parking lot for the Mahogny Flats Campground which is a free campground with ten spots that is accessible via a 4 mile dirt road that you should not attempt without four-wheel drive. The trailhead starts out in a forresty area with a decent amount of trees before getting out past the tree line. 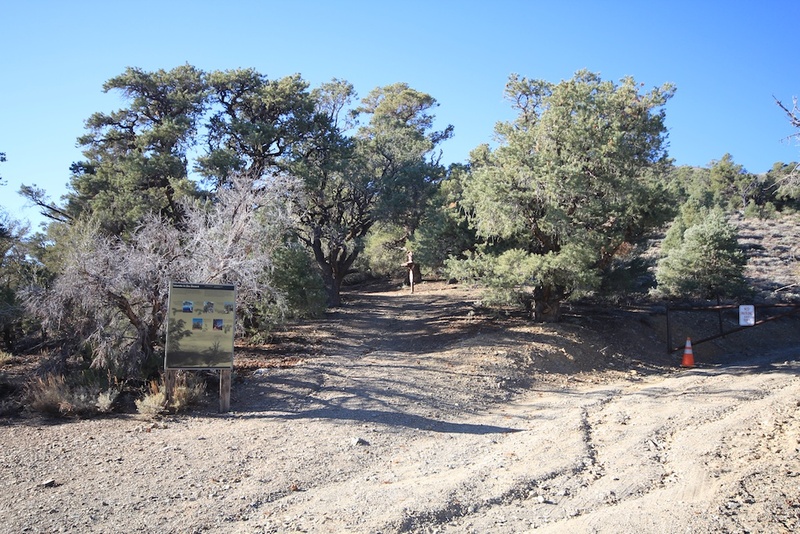 The trailhead also has a sign that shows you the many types of plant and tree life you will experience on this hike. After about a half mile you will see the trees start to become more sparse and make way for he beautiful vistas that will great you during this entire hike. To the left is the area known as Badwater which is -252 feet below sea-level and to the right is the hill that leads to the summit of Rodgers Peak. 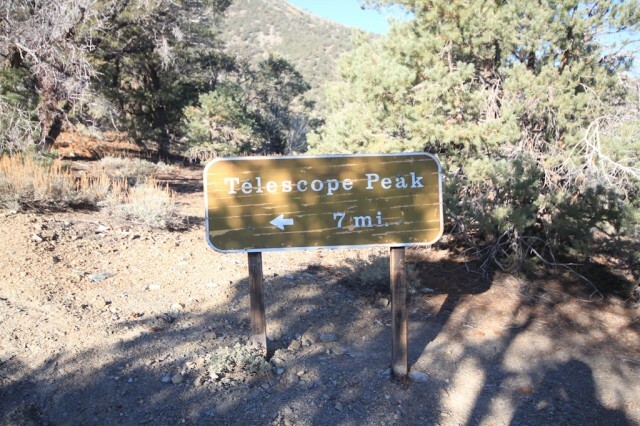 This path continues around the mountain until you see Telescope for the first time. The first view of Telescope will hit you and make you realize that even though it looks close you still have a long ways to go. 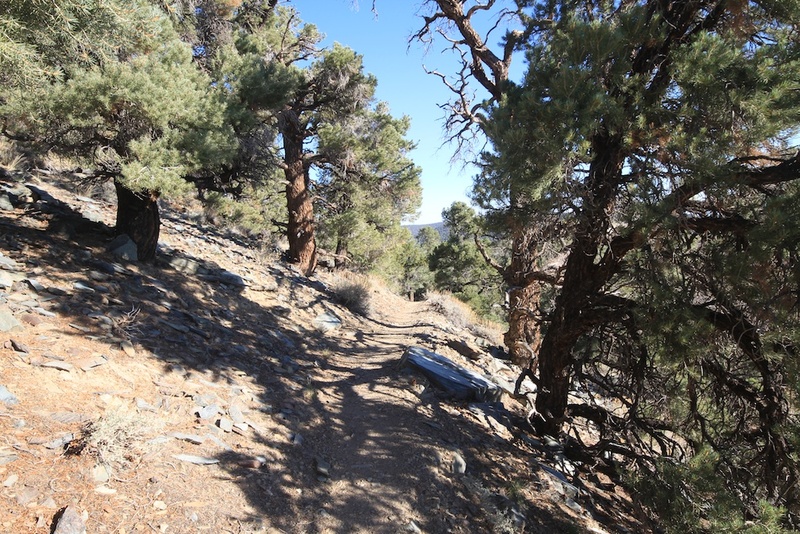 Right at the top of this part of the trail about 3 miles in is the hill that leads to Rodgers Peak. 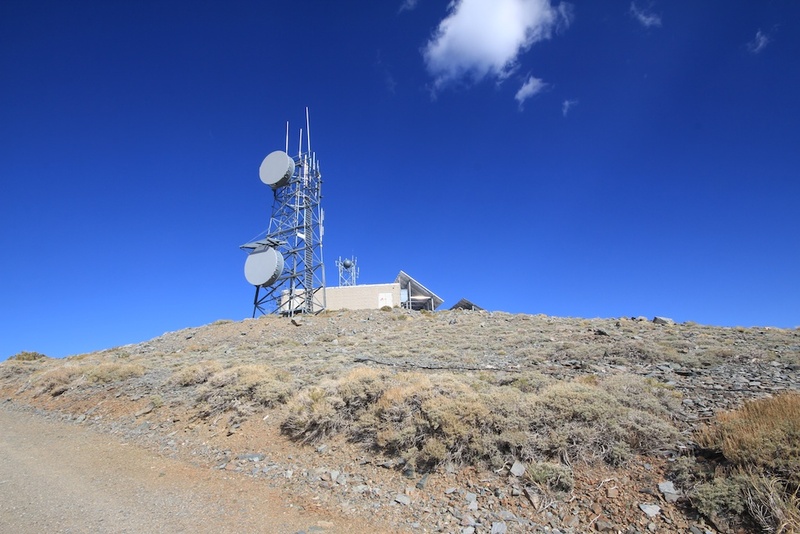 Rodgers Peak has a lot of gear and equipment on top of it as well as solar towers. 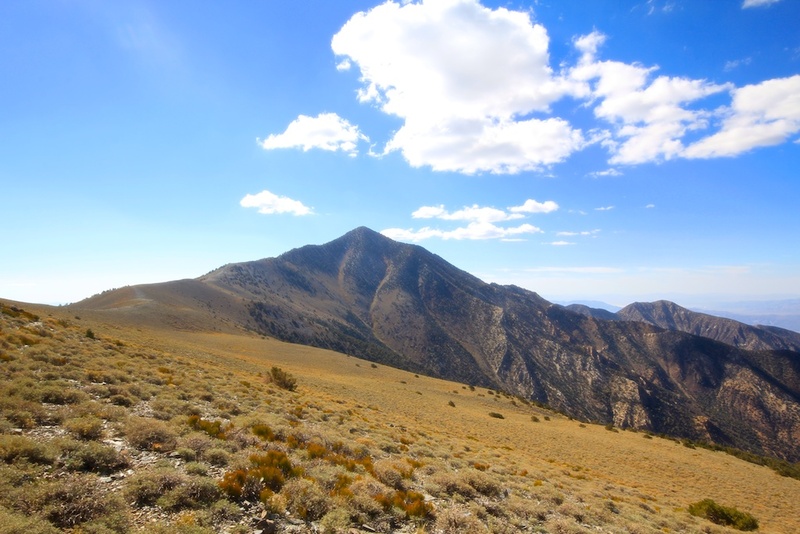 I climbed to the top on the way back but there is not a lot to see other than good views of Telescope Peak. 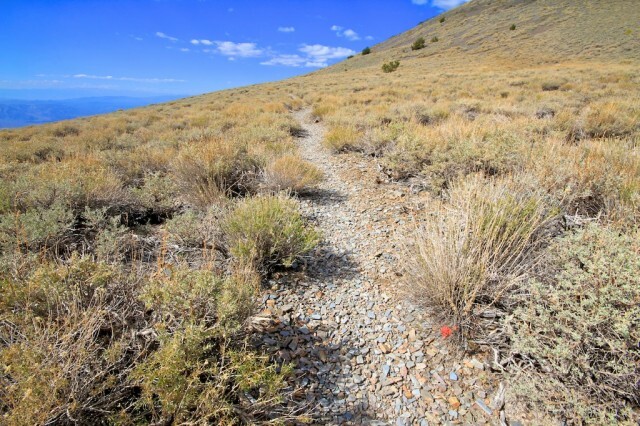 The next part of the trail is the meadows. This beautiful stretch of flat will go for about 2 miles and will wind around Bennet Peak. 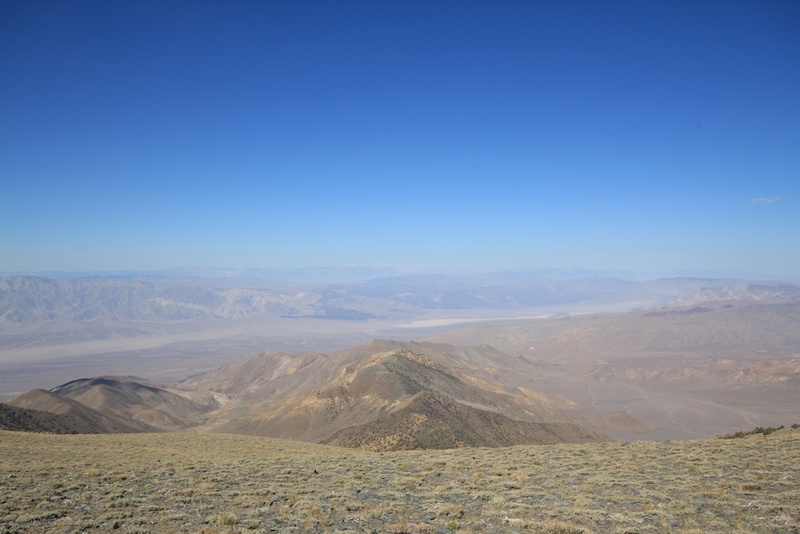 It is very sparse but is a beautiful way to shoot photos of the valley 10,000 feet below you and the peaks all around. 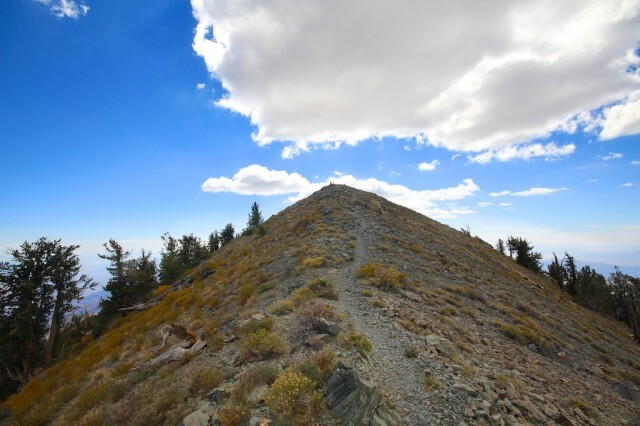 The trail goes around the West side of this peak but if you are feeling adventurous you can climb up to the summit. 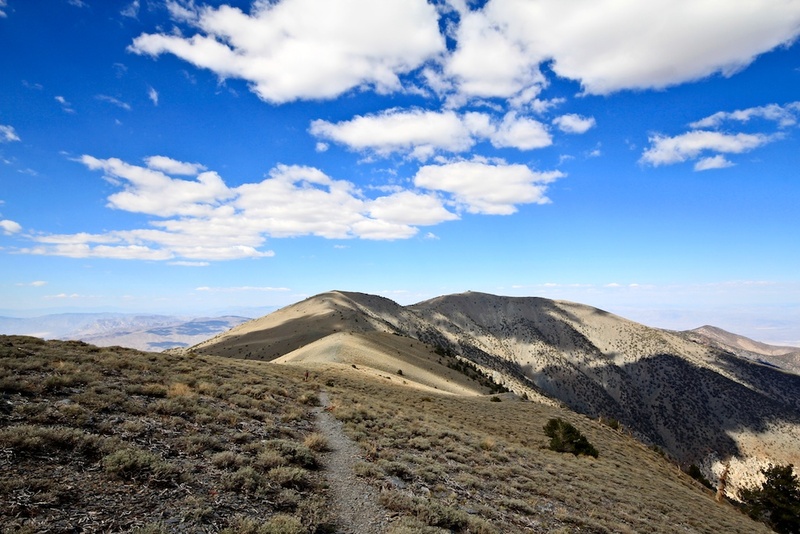 It provides more great views and is a relatively easy climb. 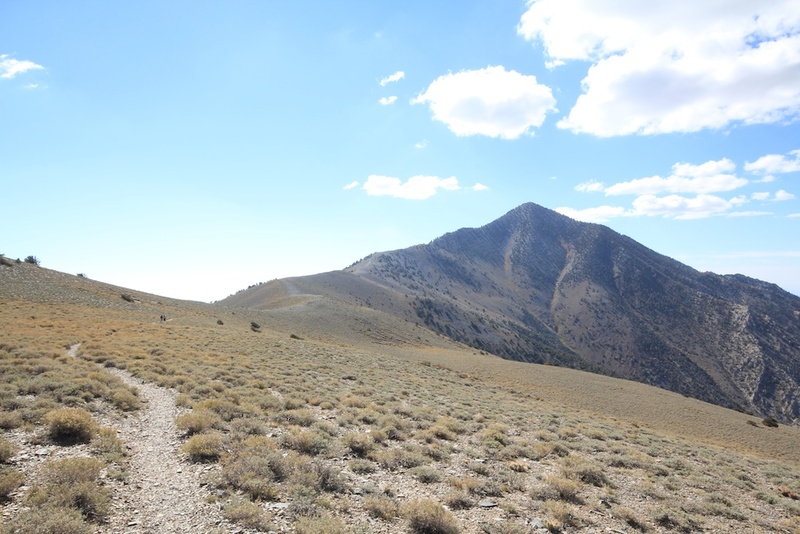 The trail continues to meander through the meadows and provides one of my favorite views of Telescope Peak before starting the uphill climb that will be your nemesis until you reach the summit. 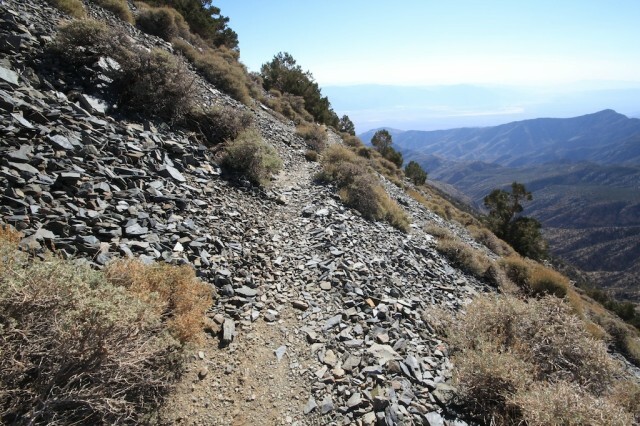 I have heard that there are only 13 switchbacks in the final push, but it seems like more than that to me. They gain a good amount of elevation but provide beautiful views of the plant life and Badwater. 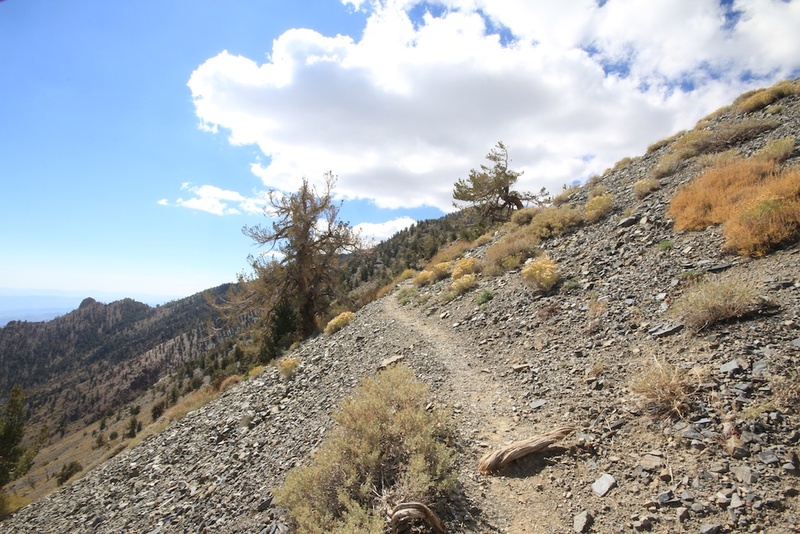 Once you plateau over the switchbacks you have about 500 yards to the summit. 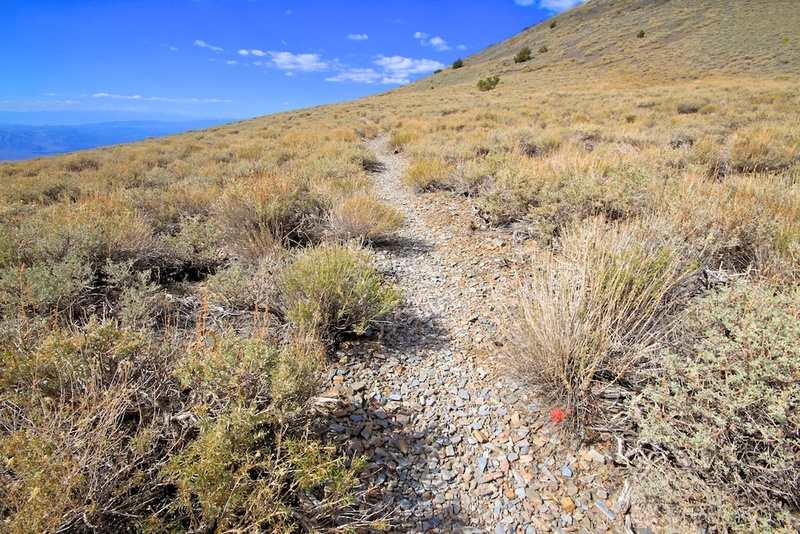 It really is a point summit with only about 20 square feet or so of area to relax on. 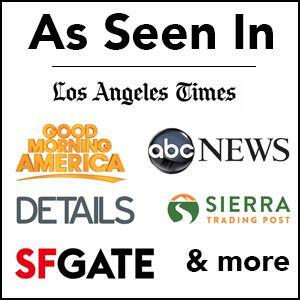 This push is nice because you can see the end goal. 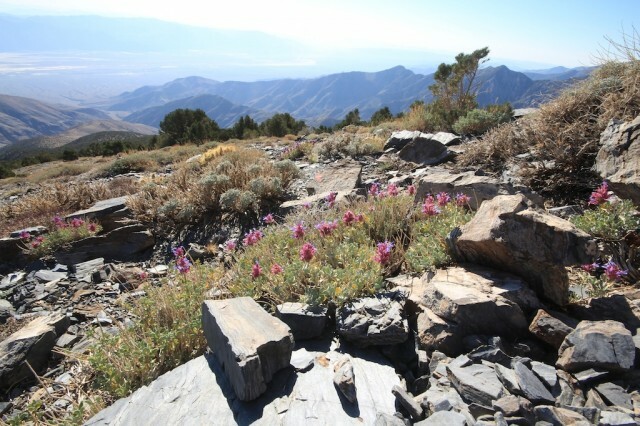 The small summit has one of the most rewarding views I have ever seen. Near 360 degree panorama of the vallies on both sides of you. 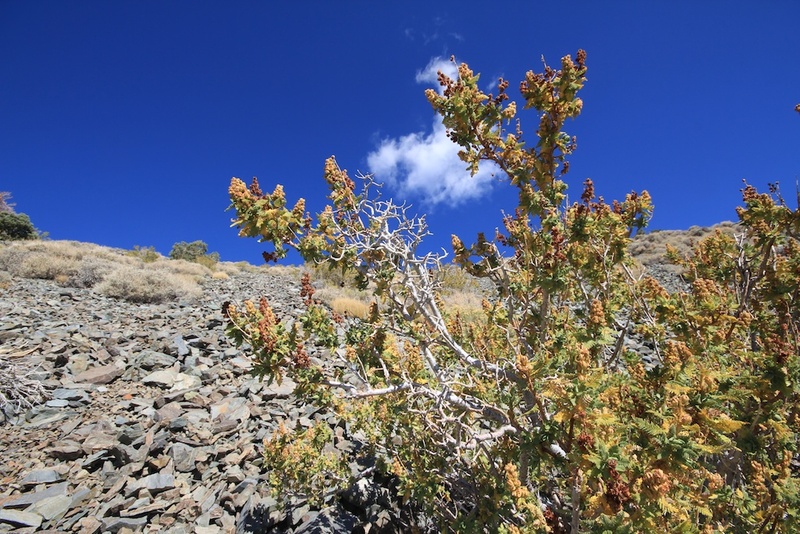 It is an amazing place to have lunch and relax. 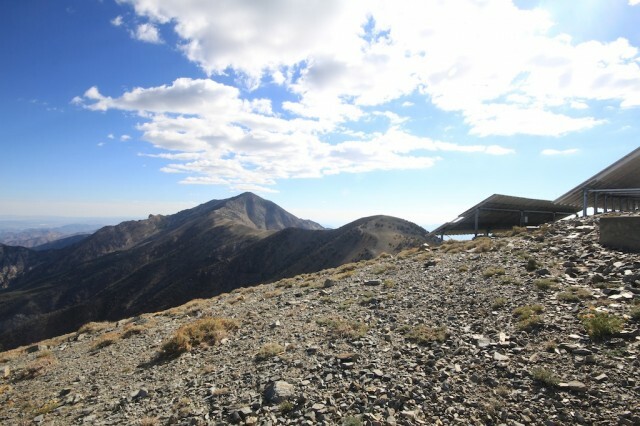 There is a summit register in a an ammo box you can sign as well. 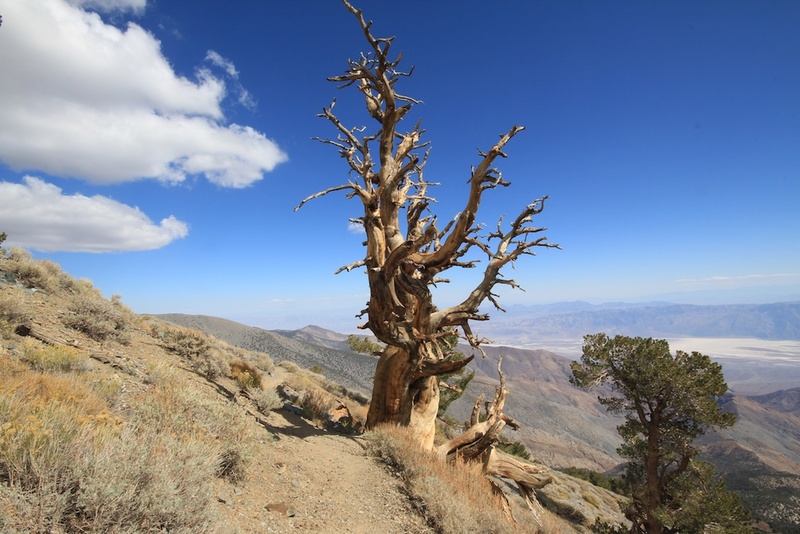 I even took the below time lapse while up there. Like I said before the drop to Badwater from the summit is around 11,500 feet. 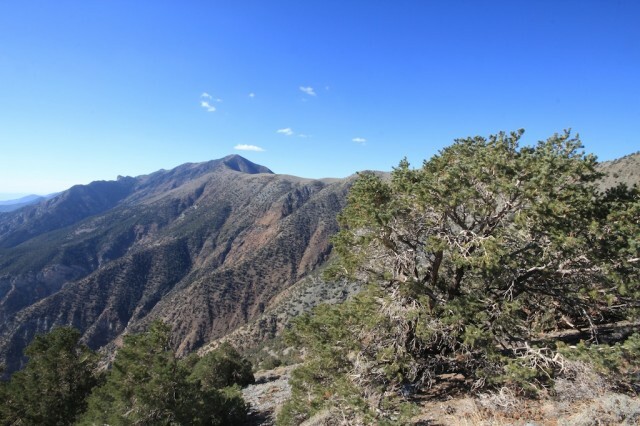 To put this drop in perspective, the actual drop from Everest summit to the North side start is around 13,000 feet and the drop at the lowest point of the Grand Canyon is around 6,000 feet. So this drop allows you to see double the normal area you can see at the Grand Canyon, making it a spectacular view to say the least. 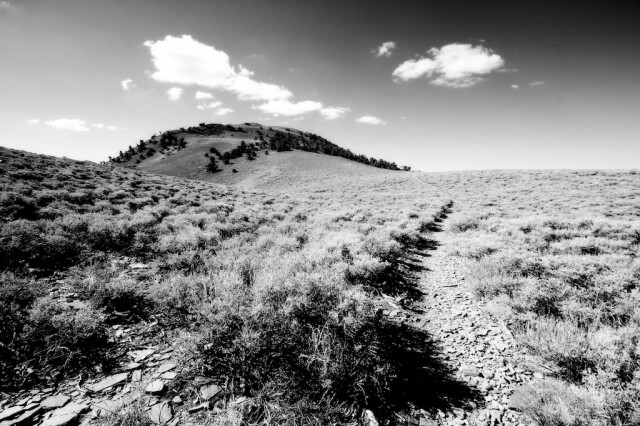 After that you simply head back the way that you came. 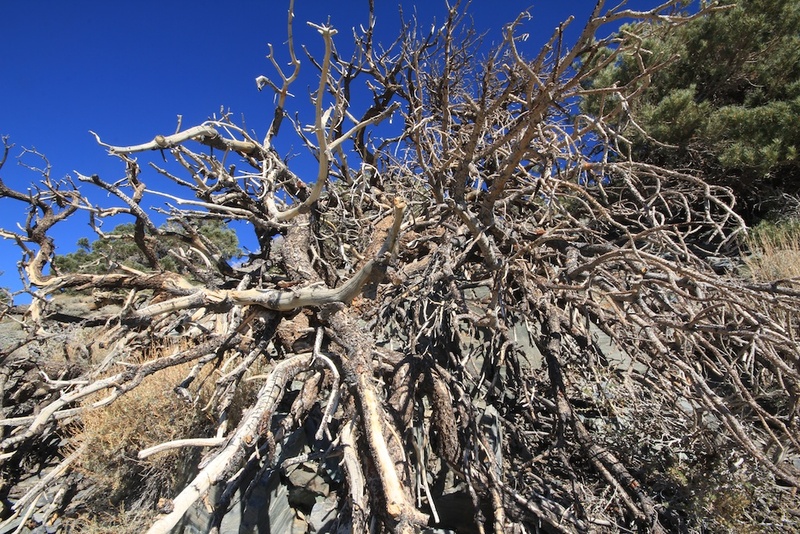 There are a ton of really cool trees you will experience on this hike, here are some of the standouts. 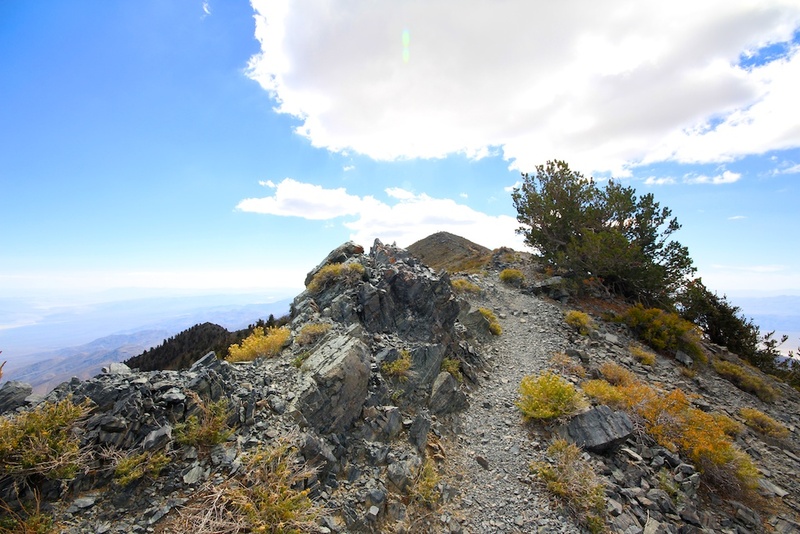 Make sure to experience this summit yourself if you are a hiker by getting directions below. 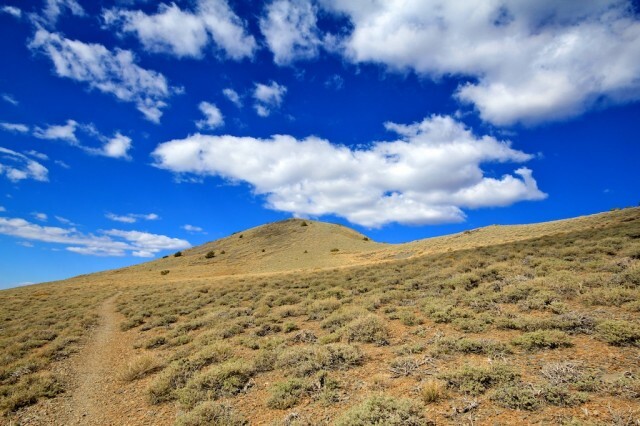 Also, make sure to bring sunscreen cause it is hot out there!